Over at Pocket Full of Liberty, Neal Dewing got some attention for writing a well-intentioned, but I think ultimately misguided piece called, “Dear Conservatives: Enough Already With The “Stars.” Here’s some of what he had to say. Samuel “Joe The Plumber” Wurzelbacher – After Obama used the words “spread the wealth around,” in answer to Wurzelbacher’s campaign stop question, Republicans breathed a great collective “Gotcha!” The third debate between McCain and Obama that year pretty much revolved around the question of Joe the Plumber. Obviously, he wasn’t the silver bullet some hoped he’d be. Nevertheless, it was enough to give Joe a few years of work in the professional conservative activist circuit and run for Congress where he lost by by a gazillion points. Dr. Ben Carson – The famed neurosurgeon made one speech in front of President Obama, and happened to say some very critical things about Obamacare and political correctness. He has no other political achievements or experience. That didn’t stop the “Draft Ben Carson” movement from gaining steam. Wouldn’t you know, he’s running for President now. And there are people with ‘Ben Carson 2016′ bumper stickers already. There’s no way this can end badly! 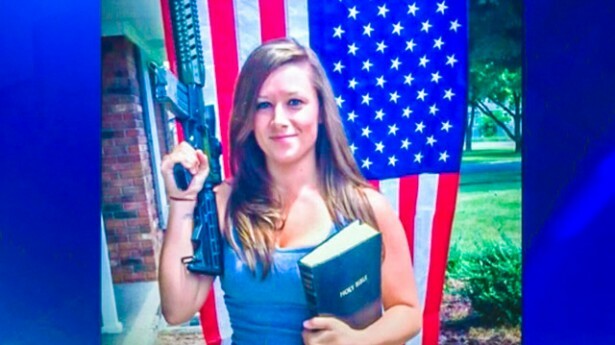 Holly “Hobby Lobby” Fisher – This rando from West Virginia posted a picture on Twitter during the Hobby Lobby case and it went viral as did a subsequent photo of her with a gun and bible posing in front of a flag. As near as I can tell that was sufficient to grant her rising-star status in the conservative movement, as she was invited to speak on a Heritage panel along with Stephen Moore and was the subject of profile by The Daily Signal. Sarah Palin – She’s not running for President nor should she. While she gave life to John McCain’s dreadful 2008 campaign, she has largely been all about Sarah ever since. She flirts with possibility of running for office from time to time, getting her rabid followers in a tizzy but then — Surprise! — she doesn’t. She could have made her mark had she remained Governor of Alaska. Instead she chose political stardom. There’s nothing wrong with people getting involved in politics. Involvement is great. But conservatives have this awful habit of looking for “the next big thing.” Too many conservative websites are pushing to give space to people who don’t really have anything original to say — but they bring traffic. And they preach to the choir. Whoopee-damn-do. In the meantime, we keep losing national elections because we’re so focused on the next “rising star” that we’re not laying the groundwork for victory. We’re turning off voters because we’re not elevating people who may be a trifle boring but offer real solutions and ideas – Senator Mike Lee, for example. ….Let’s stop making buffoons into our standard bearers. Instead, let’s look to writers who know how to break through the noise and talk to people – writers like Mollie Hemingway of The Federalist and Charles C.W. Cooke of National Review. Let’s continue to elevate thoughtful politicians such as Mike Lee. Let’s look to thinkers in the conservative movement who emulate Milton Friedman and William F. Buckley rather than boorish attention-whores like Mark Levin and Ann Coulter. Let me respectfully disagree here on, well, almost every front. First of all, it would be fair to say that our standard bearer in 2012, Mitt Romney, was a great example of someone who was a “trifle boring but offer(ed) real solutions and ideas” — and he had 1000 times more to do with our losing in 2012 than all of these people combined. Getting beyond that, I know Joe Wurzelbacher and he’s a great guy, I respect Ben Carson and Holly Fisher follows me on Twitter. However, it seems kind of weird to suggest that they’re central figures in the conservative movement that the public is judging us on. Even if they were, I somehow doubt if it would hurt us very much to have a small business owner, a brilliant black neurosurgeon and an attractive soldier’s wife getting a little more face time. It’s also kind of small-ball to see complaints that Joe got paid to do some speeches, Carson is running for President, and Holly Fisher did a panel. Are we supposed to be upset that some policy wonk who’d put people to sleep in 5 minutes isn’t getting those opportunities instead of them? Since when do conservatives resent people for their success? As to Sarah Palin, Mark Levin, and Ann Coulter, what the author calls “boorish attention-whor(ing)” could be much better described as getting people excited. We could actually use more of that in the Republican Party. For example, it would have been great if our last two presidential candidates could have gotten anyone excited outside of their immediate families. Then maybe they could have won instead of being a “trifle boring” and going down to honorable defeat. All that being said, this isn’t some kind of slap at the wonks, pollsters, and policy wonks out there. Dewing mentioned Mike Lee? Mike Lee is AMAZING. The The Heritage Foundation? Thank God for those guys and the policy work they do. Charles Cooke and Mollie Hemingway? They’re superb writers. Here’s the thing that I think the author missed: Different people play different roles in the conservative movement. * There are bomb throwers and “stars” who represent the base and get people excited. * There are think tankers and wonks who come up with policy ideas. * There are Republican Party organizations that exist to further the GOP. * There are donors and fund raisers who keep the money flowing. * There are social conservatives, fiscal conservatives and foreign policy hawks who represent different parts of the three legged stool that makes up the GOP. * There are conservative politicians whose job it is to find a way to put conservative principles into practice in government. * The Club for Growth pushes fiscal issues. The Chamber of Commerce pushes business issues. The Senate Conservatives Fund tries to make the Senate more conservative. Etc, etc, etc. Everybody has his role and ideally, they would all work in concert. For example, if you’re a policy wonk at Heritage, the best thing that could ever happen to you would be for a “star” like Mark Levin to start talking about one of your ideas. That’s because Levin can get it out to a wider audience and excite them enough to pay attention to it. Another great example is the way Ted Cruz and Mike Lee work together. They’re both smart guys, they’re both on the same page, but they also have different skillsets. Lee is more of a policy wonk and Cruz is better at firing people up. The two of them together are dynamite. Moreover, everybody needs everyone else. We’re not winning any national elections without the social conservatives. Without the policy wonks, we’d be a party of slogans and 30 year old agendas. Without groups like the Senate Conservatives Fund to keep the GOP honest, Republicans would govern far to the Left of the platforms they ran on. Everybody is important. Everybody has his role. Now, here’s where I make a big break with Dewing: I’d say to you that the conservative movement’s biggest problems don’t come from “stars,” they come from people getting outside of their roles or worse yet, failing entirely in their roles. A Republican Party group like the NRSC has absolutely no business getting involved in primaries and it was a net negative for the party in the last election because it did so. The Chamber of Commerce created an enormous amount of ill-will with conservatives by being willing to screw everybody else in the party to push amnesty and open borders. However, the biggest failure in the conservative movement right now is a failure in leadership in Congress. Simply put, John Boehner and Mitch McConnell aren’t very good leaders. They’re not talented strategists, they’re not charismatic, they’re not trusted, and they’ve alienated a lot of conservatives. When you hear someone like Mark Levin rip Boehner and McConnell up one side and down the other, all he’s doing is fulfilling his role. He has millions of listeners and he’s expressing what they think. They don’t think Boehner and McConnell are doing a good job of representing their views. Radio talk show hosts like Levin, Limbaugh and Hannity are their voice. The Republican Party has poor leaders, it doesn’t pay enough attention to what the rank and file wants, and not only does it stick with doddering old fossils like Pat Roberts and Thad Cochran for too long, it will choose squishes like Charlie Crist and Arlen Specter over just as electable conservatives every time. If the Republican Party’s leaders stopped doing those things, the primaries would stop, trust could be rebuilt and the complaints would slow down from a river to a stream. That’s the real imbalance that desperately needs to be corrected. So instead of resenting the “stars” for being “stars,” we should start encouraging people to play their roles to the hilt. If we ever get to that point, that’s when you’ll really start to see the conservative movement spring forward and achieve its potential.